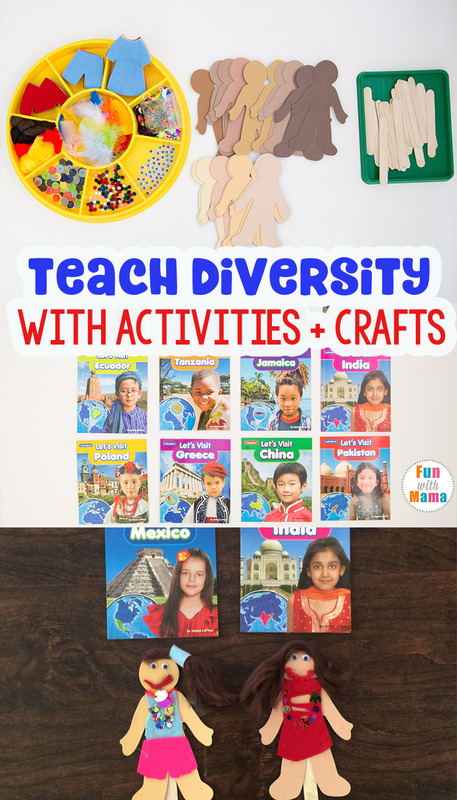 Check out these 10 Cultural Diversity Activities for Elementary Students to teach children about children of the world. The world is so large that it can be tough to teach children about places that exist outside of their own immediate physical world. There is so much to learn about other countries and people. We lived in America and we also spent 10 years in South Africa. 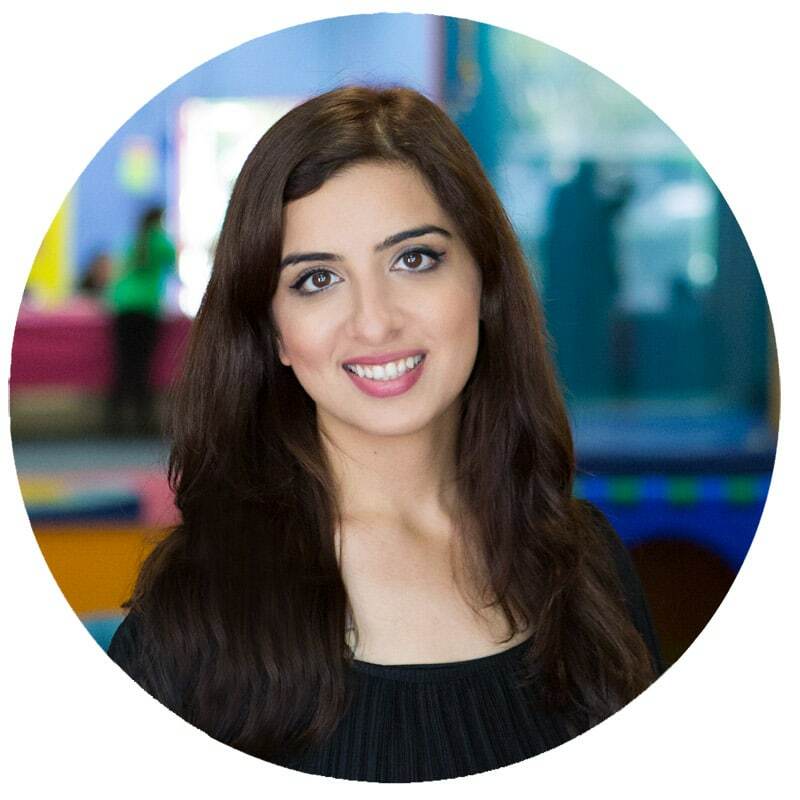 I was fascinated by the cultural differences and daily norms that were each so very different from the life I lived in America. From music, languages and food to school, dressing and sports there is so much of beauty and excitement that each country and culture brings to our world. 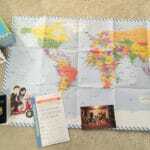 My best advice, is to choose one country a week and do a small “trip around the world” each week. 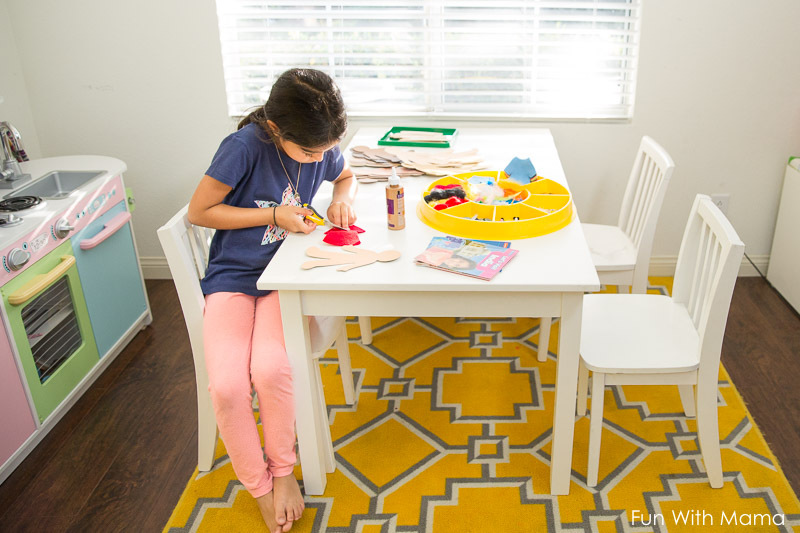 These cultural activity ideas are great for the classroom as well as for home too. You could make it even more fun by choosing one particular day a week that you would be ‘flying’ out to this country to experience some of their culture. 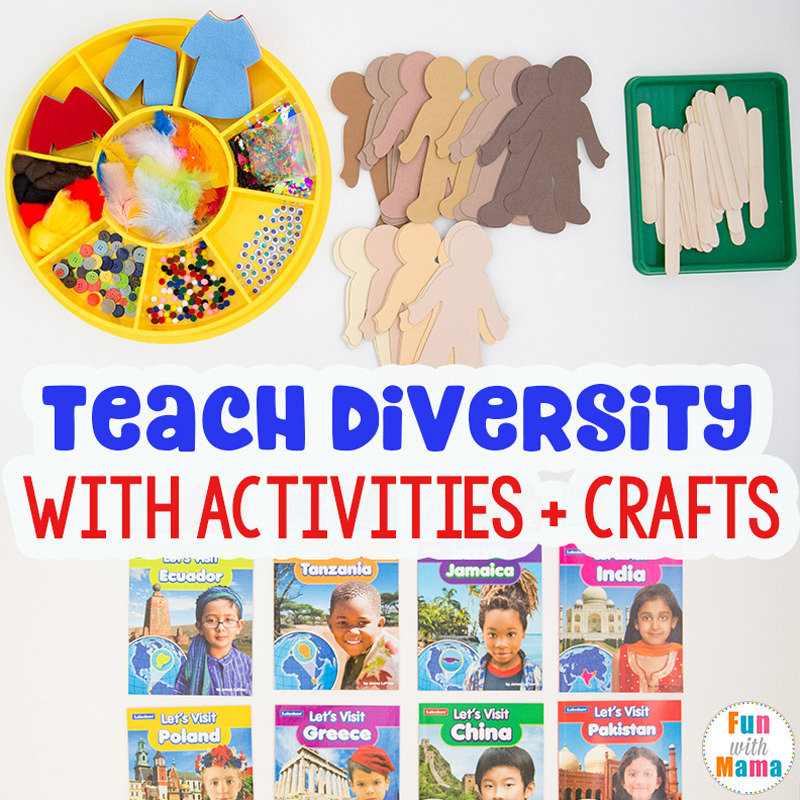 Here are my favorite activities to teach children about diversity. 1. Read books about other countries and their special cultures. We really love the Lakeshore Children of the World Book Set. The books contain interesting facts, more about the spoken language, what the money looks like and wonderful discussion questions to ask students. 2. 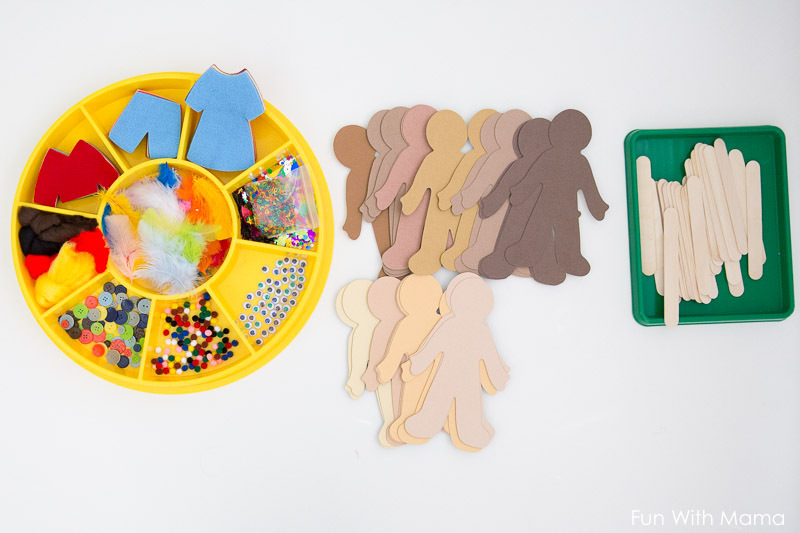 Do a craft activity that would encourage a child to focus on the different physical features of people from different countries. The People Shapes Project Kit was perfect for this! It included tacky glue and everything you see below minus the tray’s. We were focusing this week on India and Mexico. So she set out to create an Indian and Mexican little girl. 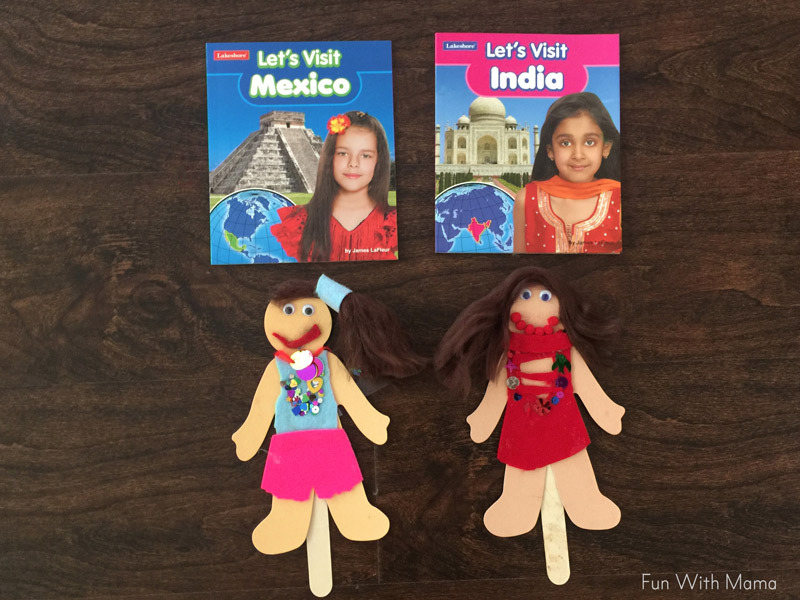 She noticed that the Indian girl was wearing a lot of sparkly sequins on her outfit and added these to her paper doll puppet. My 8 year old really enjoyed this project. It was definitely a little tough for my three year old to do, as she needed a lot of help with gluing and cutting small parts and pieces. 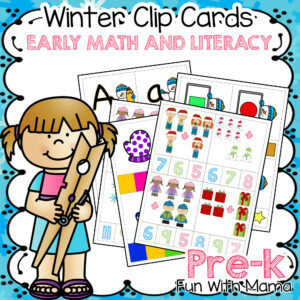 This activity is perfect for elementary aged students. 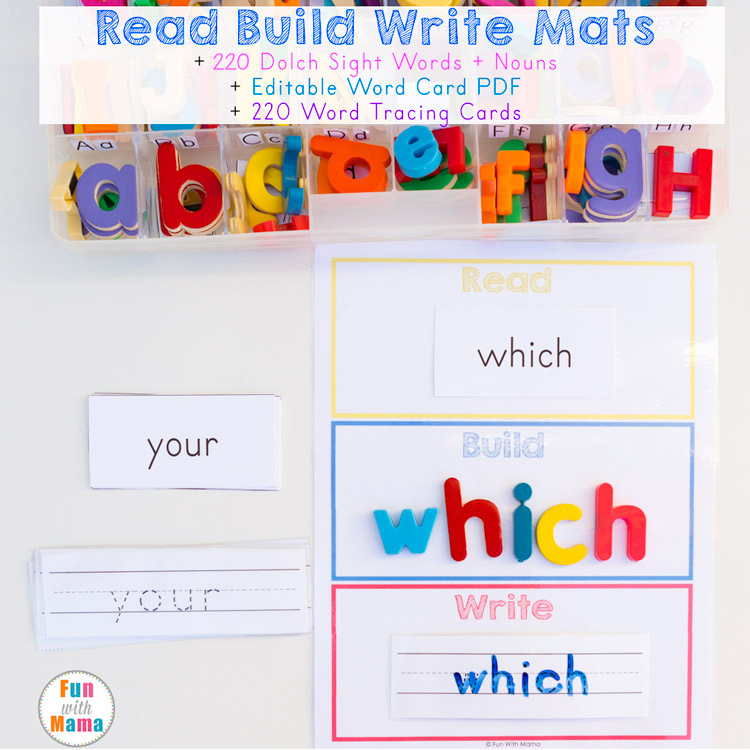 This would be a wonderful classroom activity. 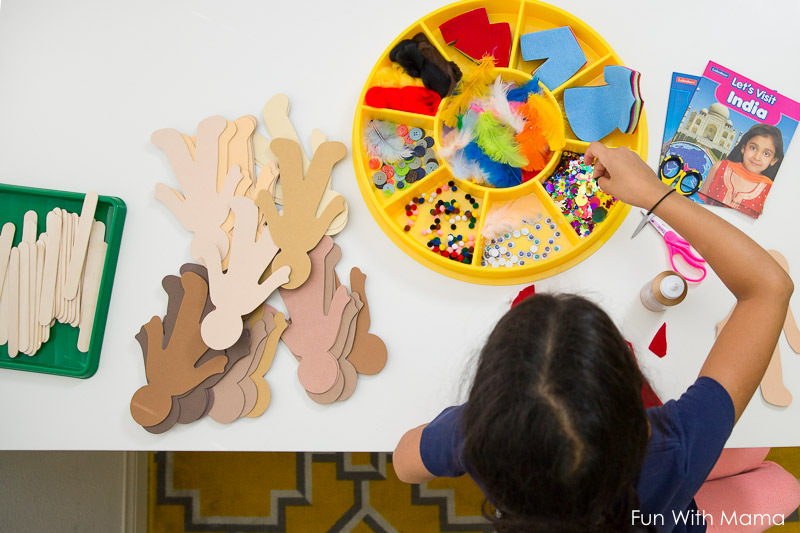 You could have each child build a ‘puppet’ from one country and then stick them around the room. 3. 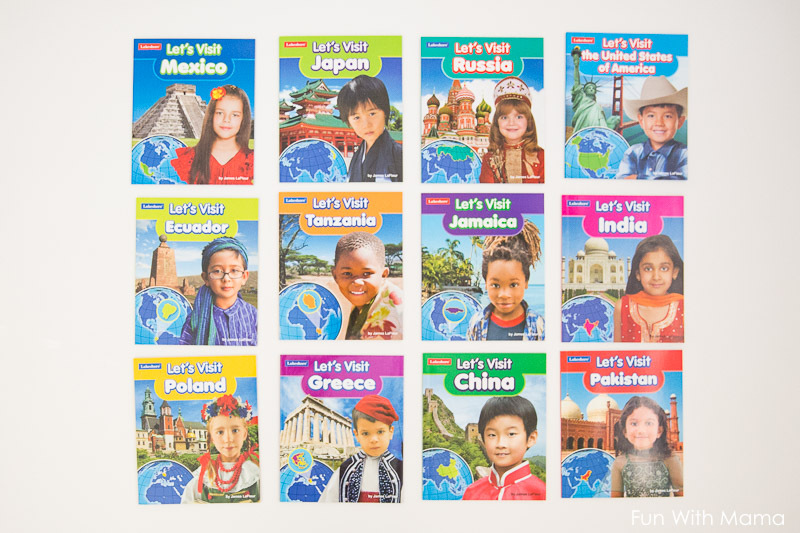 Print out a world map or use a globe to show your child or student where each country is located. You could even talk about how many hours it would take to fly to that country. 4. 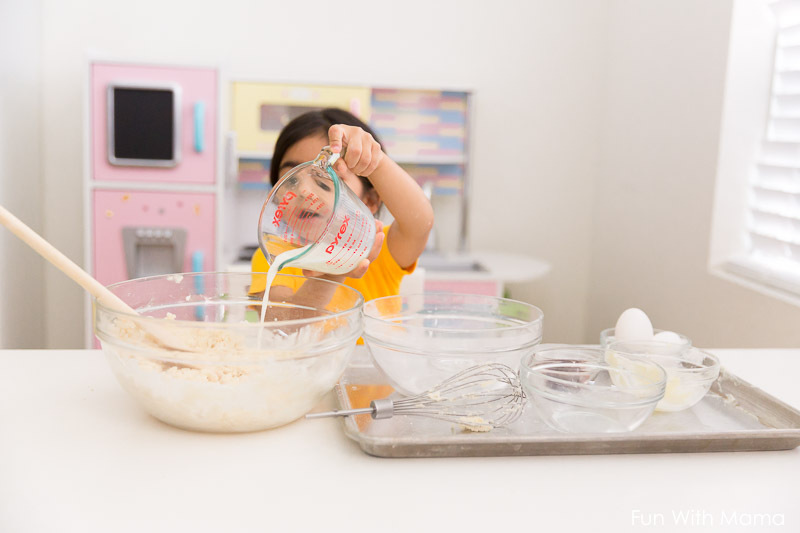 Bake or cook a special recipe from other countries. 5. Go visit a restaurant that has authentic food from other countries. Sample cuisine from these countries. For example, have curry at an Indian restaurant. 6. Listen to music from other countries – ask students what they think of the music? Does it make them feel like dancing? 7. 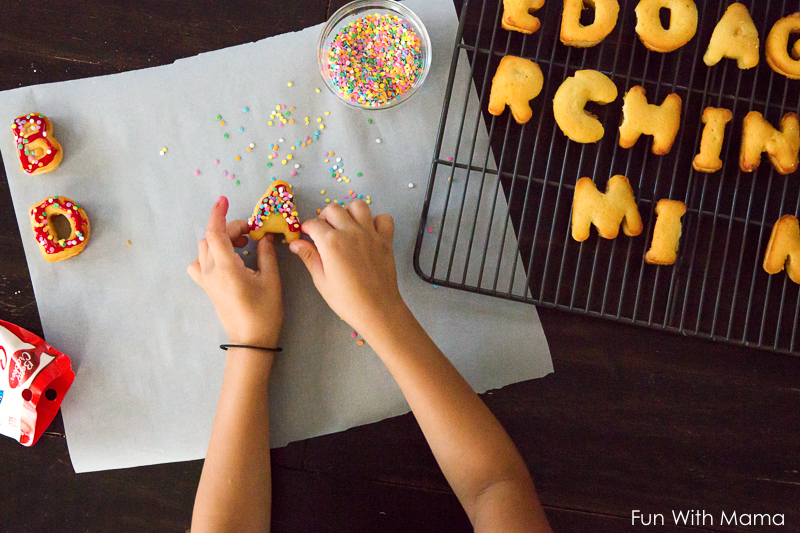 Spelling the country names – We used Lakeshore’s Sweet Treats! 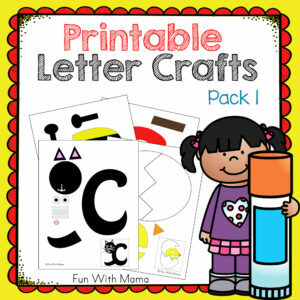 Letter Molds to bake these little cakes together. Once we were done decorating the cakes we would spell out each country’s name before eating them all up. 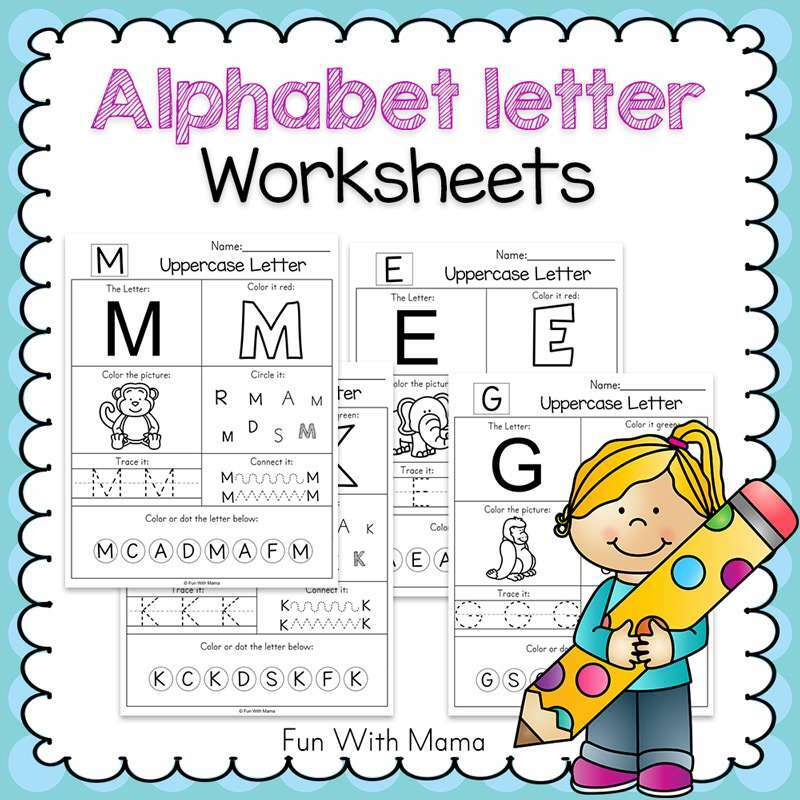 I’m always trying to weave spelling and hidden learning into all the activities we do together. 8. Listen to a recording of a person speaking that language. 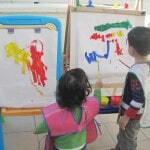 It would be so interesting to see if the children can understand any of the words that the person is saying. 9. Learn how to say hello and goodbye in each language. 10. Talk about animals that live in each country. Children always love learning more about animals. DON’T FORGET TO GRAB THE COUPON CODE! 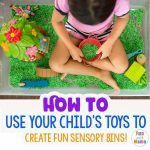 Want to buy some of these toys? 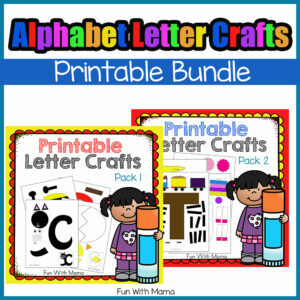 Lakeshore Learning has graciously offered the Fun With Mama community a 20% off coupon code for any one single, non sale item. Click here to redeem that coupon! 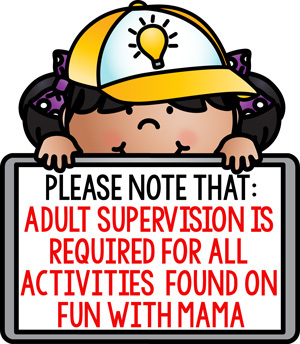 To learn more about Lakeshore Learning, find them on Facebook, Instagram, Twitter and Pinterest. 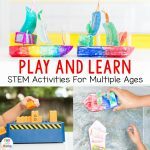 Play and Learn – STEM Activities + Toys for Multiple Ages!